On April 27th, from 9:30 a.m. to 1:00 pm, the Springfield Fire Department is partnering with the American Red Cross to install FREE 10-year sealed battery smoke alarms for FREE in the Grandview Area! They will be placing advertisement door hangers on Wednesday, April 24th. They are providing a free service to all the residents to check your smoke detectors and make sure they are installed properly and in working order. Their goal is to install 225 alarms, and with this free service, all residents should take advantage of this great opportunity to save the lives of your family and pets. A house fire can happen to anyone at anytime. Its very important to have working smoke detectors and have a safety plan to keep your loved ones safe. If you want to make sure you that you take advantage of this FREE life-saving protection, you can call the Springfield Fire Department’s Fire Safety Division at 217-789-2170 at be put on the installation list or set up an appointment. Please take advantage of this free service. It could save your life! If you would like to volunteer to assist with this event, please arrive at Wanless Elementary School ( 2120 E Reservoir St ) by 9:00 am for training and orientation. 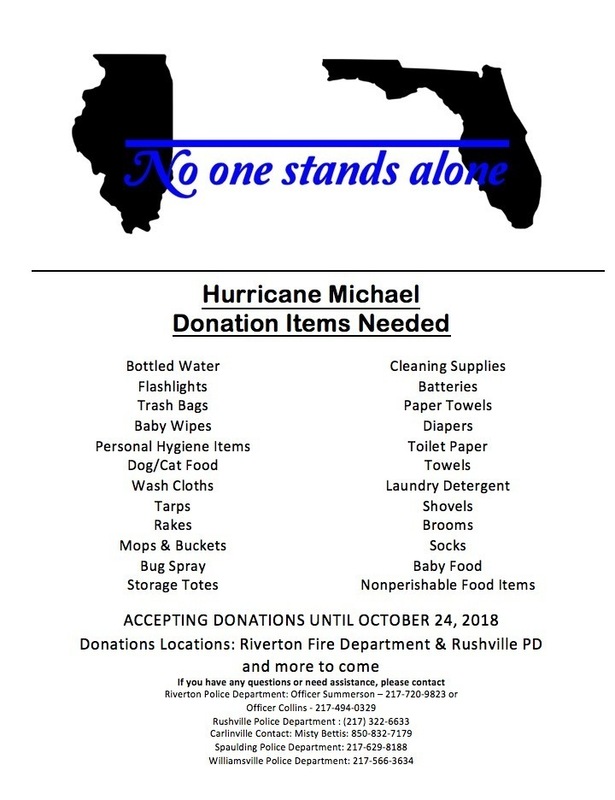 The Village of Grandview Police Department will be joining the efforts in collecting donations for the people affected by Hurricane Michael. Please donate if you can. CDL with Air brake endorsement required, (will assist). Duties include walking and kneeling down to take accurate water meter readings. Operate power-driven equipment such as trucks, loaders and related tools used in maintenance and repair work. Perform a variety of maintenance work in the construction, maintenance, and repair of streets, water meters, buildings, and other public facilities. Perform a variety of tasks on street cleaning, cement, patch, or lot clearing . Break out old concrete work such as curbs, sidewalks and gutters. Cut and prepare streets for patches, spread premix and rake and lube, compact asphalt. Read water meters, perform and/or coordinate repairs on water lines. Clean and maintain basic tools used on the job. Paint traffic directional markings, such as crosswalks safety loading zones. Install, and repair street signs. The Village of Grandview along with Sierra Club and BLH Computers are offering a free electronic drop-off for Grandview residents starting Friday Sept. 7th through Saturday October 6th. BLH computers is located at 1832 Stevenson Dr., Springfield, IL 62703. All residents are eligible to drop off televisions and/or CRT (tube) monitors at no cost. These items are limited to 3 per verified residency per car load. Any other bathroom / kitchen appliance electronics are PROHIBITED.. and NO open glass CRT or broken glass TVs will be accepted. Drop off Hours are Monday - Friday 9:00 am to 5:00 pm Saturday 10:00 am - 5:00 pm. The Village would like to remind residents that anyone that knocks on your door soliciting work or wanting to "see your Ameren bill to save you money" needs to have a Solicitors permit. Please ask them for their permit. As of today, there are no active Solicitor's Permits that have been given. If you see people walking around call the police department. If you are in need, we still have NO Solicitor signs in the office that you may display on your door. The Village of Grandview is accepting applications for a position in the Street Department. 40 hour work week, health insurance, and vacation, sick and personal time provided. Pick up an application at the Water Department from 9 am to 1 pm Monday - Friday. The most recent crash data from the National Highway Traffic Safety Administration found that 43 percent of passenger vehicle occupants killed in crashes in 2015 were unrestrained. That percentage increases to 57 percent when just looking at crashes that occur between 6 p.m. and 5:59 a.m. That’s why one focus of the Click It or Ticket campaign is nighttime enforcement. Participating law enforcement agencies will be taking a no-excuses approach, writing citations day and night. Motorists caught not buckled up will be ticketed, and those caught driving impaired will be arrested. So that guy didn’t get very far and ended up in a cop car. Three cheers for the #designateddrivers! Have you taken your turn? Pay it forward and drive sober. Your friends will thank you, and you may just save a life. Every 52 minutes, someone is killed by a drunk driver in the United States. Designate a sober driver and save a life—maybe even yours. #DriveSoberorGetPulledOver. Stop the nonsense! Did you know that more than 10,000 people are killed every year by drunk drivers? When you go out this #StPatricksDay, bring your lucky charm: a sober #designateddriver. Dec. 16-Jan. 1, Illinois law enforcement will be out in full force, cracking down on drunk driving. Drive Sober or Get Pulled Over. One-third of all fatal crashes in America involve drunk driving. That means a third of all fatal crashes are preventable. Drive Sober or Get Pulled Over. You can save a life … maybe your own. Either you’re sober, or you’re not. There’s no such thing as “OK to drive” when you’ve been drinking. Drive Sober or Get Pulled Over. True or False? One-third of all fatal crashes in America are 100% preventable. True. Drunk driving is a reckless, preventable crime, involved in more than 30 percent of all fatal crashes. Drive Sober or Get Pulled Over. If everyone drove sober across the U.S., there would be more than 10,000 people still alive each year. That’s a lot of lives destroyed. Do your part. Drive Sober or Get Pulled Over. The Grandview Police Department will be participating in the Halloween Click It Or Ticket Enforcement campaign. In addition to not drinking and driving, we also remind people many small children will be out trick or treating on Halloween and please use extra caution. A jail cell doesn’t make for a Happy Halloween. If you drive impaired, expect a change of costume. #DriveSober or Get Pulled Over. • If you drive impaired by alcohol or drugs this Halloween, no amount of tricking will keep you out of handcuffs. #DriveSober or Get Pulled Over. You know who says, “Boo!” scarier than any ghost? It’s the cop that’s waiting to catch you driving drunk. If you’re drinking this Halloween, you better not be driving. #DriveSober or Get Pulled Over. • During the crackdown, expect to see us on the roads with roadside safety checks & patrols. If you’re #drunkdriving, we’ll be there. • Officers will be pulling over ‪#‎drunkdrivers‬ during the crackdown. Be prepared: arrange a #designateddriver BEFORE you drink. • Our message this crackdown and all year-round is clear: #DriveSober or Get Pulled Over. • A drink could ruin your life and the lives of others. Make the right choice: #drivesober or have a sober #designateddriver. • When cops take the #DriveSober or Get Pulled Over campaign to the streets, lives are saved. RT to support the crackdown. • Volunteer to be a sober #designateddriver: your friends will thank you and the roads will be safer! • Cops will be out in force to stop #drunkdriving from taking lives. You can help: RT to support the crackdown! • Do you know a friend who’s been a #designateddriver? Thank them: they helped save lives, including yours. • Going to a bar or a party? Make certain you’ve got the phone numbers for your sober ride home BEFORE you drink. • If your friend’s got a drink in one hand and keys in the other, take the keys. You can be the difference between life and death. • There are horrible consequences for #drunkdriving that will ruin your life, even if you’re not injured or killed. Find a #designateddriver. • #Drunkdriving can do more than destroy your life: it can end it. Find a sober #designateddriver before you drink. • Officers will be out this Labor Day weekend to enforce the #DriveSober crackdown. Want to avoid them? Don’t drink & drive. Springfield, IL –The Grandview Police Department will join the Illinois Department of Transportation (IDOT), the Illinois State Police and hundreds of local law enforcement agencies across the state for the 2016 Click It or Ticket campaign that runs from May 16-30. Officers will be out in force day and night during this time frame, cracking down on seat belt law violators and impaired drivers. Motorists caught driving unbuckled will be ticketed and those caught driving impaired by drugs or alcohol will be arrested. All Village Families are Welcome!!!!!!!!!!!!!!! We will have hot dogs, dessert, refreshments available. Easter Egg hunt prizes and doot prizes will be given out and a Magican, Mr. Landry and his bunny, Snowball, will give a performance once again this year! Vendors will also be on-site with crafts and items for sale. Feel free to come early and visit! December 18-January 3, Illinois law enforcement will be out in full force, cracking down on drunk driving. Drive Sober or Get Pulled Over. Did you know the average cost of a DUI in the United States is $10,000? What else could you do with that money? A taxi is much more affordable. A third of all fatal crashes in America involve drunk driving. That means a third of all fatal crashes are preventable. Drive Sober or Get Pulled Over. You can save a life, maybe your own. Either you’re sober, or you’re not. There’s no such thing as just “OK to drive” when you’ve been drinking. Drive Sober or Get Pulled Over. True or False? A third of all fatal crashes in America are 100% preventable. True. Drunk driving is a reckless, preventable crime, involved in 30+ percent of all fatal crashes. Drive Sober or Get Pulled Over. If everyone drove sober across the U.S., there would be more than 10,000 people still alive each year in America. That’s a lot of lives destroyed. Do your part. Drive Sober or Get Pulled Over. We want all drivers and passengers to #ClickitorTicket, day and night- and remember #DriveSober or Get Pulled Over. Remember- November 16-29 is the Illinois #ClickitorTicket campaign.Buckle up and encourage your loved ones to do the same. Statistics show nighttime drivers are less likely to buckle up compared to daytime drivers- don’t be a statistic, #buckleup. #ClickitorTicket isn’t about the citations; it’s about saving lives. Men make up the majority of those killed in motor vehicle crashes.Remind the men in your life to buckle up! Grandview, IL — This Halloween, The Grandview Police Department is cracking down on impaired drivers with an aggressive Drive Sober or Get Pulled Over enforcement effort, and is giving a fair warning to all partygoers: keep the party off the road. According to the National Highway Traffic Safety Administration (NHTSA), nationally 43 percent of all people killed in motor vehicle crashes on Halloween night (6 p.m. Oct. 31 – 5:59 a.m. Nov. 1) from 2009 to 2013 were in crashes involving a drunk driver. On Halloween Night alone, 119 people lost their lives during that same period. Children out trick-or-treating and the parents or others accompanying them are also at risk, as 19 percent of fatal pedestrian crashes on Halloween night (2009-2013) involved drunk drivers. In every state, it’s illegal to drive with a blood alcohol content of .08 or higher. In 2013, 10,076 people were killed in drunk driving crashes (crashes involving at least one driver with a blood alcohol content of .08 or above) in the United States. Even if you drive impaired and aren’t killed or seriously injured, you could end up paying as much $18,000 for a DUI. Plan a safe way to get home before you attend the party. Designate a sober driver, take public transportation, a car service, or a call a sober friend of family member to get home. Walking while impaired can be just as dangerous as driving impaired. Designate a sober friend to walk you home. If you see an impaired driver on the road, contact local law enforcement as soon as it’s safe to do so. August 24-September 7, Illinois law enforcement will be out in full force, cracking down on drunk driving. Drive Sober or Get Pulled Over. Either you’re sober, or you’re not. There’s no such thing as just “OK to drive” when you’ve been drinking.Drive Sober or Get Pulled Over. Labor Day weekend is coming up, and so is the national crackdown on drunk driving. August 24-Sepmber 7, expect to see ramped up enforcement efforts, including roadside safety checks and more patrols on the road. Drive Sober or Get Pulled Over. If everyone drove sober, there would be more than 10,000 people still alive each year in America. That’s a lot of lives destroyed. Do your part. Drive Sober or Get Pulled Over. Motorcycle riders have the highest overall rate of alcohol impairment in fatal crashes. In 2013, 27 percent of the motorcycle riders killed were driving impaired. Drive Sober or Get Pulled Over. (Springfield, IL) – The Grandview Police Department today announced plans for July 4th traffic enforcement, focusing on both drunk and unbuckled drivers. The intensified enforcement effort will focus on late-night hours as statistics show a disproportionate number of traffic deaths occur late at night and involve a drunk driver and/or unbuckled motorist. The crackdown is part of the statewide, Independence Day Drive Sober or Get Pulled Over and Click It or Ticket effort. The Grandview Police Department will join the Illinois State Police and hundreds of police and sheriff’s departments in a statewide enforcement effort that begins June 22 and runs through July 5th. HELP WANTED.... The Village of Grandview is looking for a high school Jr. or Sr. for summer employment. Grandview is wanting someone for summer mowing and weed eating duties. Anyone interested must be a Grandview resident and can apply at the Water Department between 9am - 1pm Monday thru Friday. Deadline for applications is June 15th, 2015. Grandview, IL – From December 19 through January 4 of the New Year, The Grandview Police Department will be out in force as part of the annual Illinois “Drive Sober or Get Pulled Over” crackdown on drunk drivers. The statewide crackdown will include high-visibility alcohol and ...belt enforcement throughout Grandview. The statewide crackdown will also be supported by national and state paid advertising, creating a comprehensive campaign to curb drunk driving during the holiday season. The Grandview Police Department said its officers will be aggressively looking for drunk drivers during the crackdown and will arrest anyone caught driving drunk. In addition, front and back seat belt law violators will be ticketed. The Grandview Police Department is giving fair warning to all partygoers. You’ll see us out there during this highly visible enforcement period. Drunk drivers will be arrested and those not observing seat belt laws will be ticketed. Being arrested for driving drunk brings a wide range of negative consequences into one’s life. Drunk drivers face jail time, loss of their driver licenses, and steep financial consequences such as higher insurance rates, attorney fees, court costs, lost time at work and the potential loss of employment. Driving drunk is simply not worth the risk. So don’t take the chance. Remember, we will be out in force and we will be watching, so Drive Sober or Get Pulled Over. The law enforcement crackdown is funded by federal traffic safety funds through the Illinois Department of Transportation. Grandview, IL – Police and safety officials in Grandview are reminding residents to fasten their seat belts and drive sober over the Thanksgiving holiday or run the risk of receiving a ticket. The Grandview Police Department is joining the Illinois Department of Transportation (IDOT), the Illinois State Police (ISP) and local law enforcement agencies across the state to save more lives by strongly enforcing seat belt and impaired driving laws. IDOT is proud that Illinois has a 94.1 percent daytime seat belt usage rate. However, far too many drivers and passengers still do not buckle up – especially late at night. During the 2013 Thanksgiving holiday weekend in Illinois, seven people lost their lives and 723 motorists were injured in motor vehicle crashes- three of those deaths involved alcohol. Remember – wearing your seat belt is your best defense against an impaired driver. According to the U.S. Department of Transportation’s National Highway Traffic Safety Administration (NHTSA), seat belts saved over 12,000 lives nationwide in 2012. Buckle up and encourage your loved ones to do the same. You will save the cost of a ticket and may save a life. For more information about the Click It or Ticket and the Drive Sober or Get Pulled Over campaigns, please visit www.buckleupillinois.org. The hours for the Village of Grandview Trick or Treating will be from 5:00pm to 8:00pm on Friday, October 31st, 2014. The Grandview Police department will again be handing out bags of candy to children, in costume, at the corner of Wolfe and Converse. This will be conducted beginning at dark and ending when supplies run out. Please pay extra attention for the many children that will be walking in the area and crossing streets. The entire month of April has been declared "National Distracted Driving Awareness Month." The main goal is to reduce accidents caused by distracted driving, mostly as a result of talking and texting on cell phones. Even though Illinois has adopted a hands free device law, people are still encouraged not to use cell phones, even in hands free mode. The National Highway Transportation Safety Administration (NHTSA) has published studies indicating hands free devices do not significantly reduce the risk of accidents caused by distracted driving. Having a cell phone conversation on a hands free device still diverts a driver's full attention away from the road. Although there will not be any dedicated patrols enforcing the new cell phone laws, the Grandview Police Department will instruct it's officers to make this a priority enforcement during the month of April. The new law has now been in effect for 3 months and most people should be fully aware of it by now. The Springfield Sangamon County Regional Planning Commission has asked the Village to share with their Residents a survey to collect their valuable input for the Long Range Transportation Plan. Please click on the link below and share your thoughts on this topic. Your input is VALUABLE and is NEEDED! The Grandview Police Department will be conducting special patrols for the St. Patrick's Day Holiday to crack down on drunk drivers. Unbuckled motorists will also be ticketed. The Grandview Police Department is reminding everyone this weekend to designate a sober driver before any party begins. The holiday enforcement will begin March 13th and run through March 17th. In addition to drunk drivers, the Grandview Police will also be stepping up both daytimes and nighttime seat belt enforcement. 4. Keep phone numbers for local cab companies handy and take keys from anyone who is thinking of driving drunk. 2. If you do not have a designated driver, ask a sober friend for a ride home, call a cab, sober friend or family member to pick you up, or just stay where you are and sleep it off. 4. Always buckle up - it is still your best defense against a drunk driver. Stay safe and enjoy the weekend. The Village Board has rescheduled its board meeting this week. The board will meet on Thursday January 9th instead of January 7th. Sorry for any inconvenience this may cause. With deepest sorrow, we regret to inform you our employee, Kelly Stufflebeam, passed away on Monday, October 21st. In his honor, the Village will fly our flag at half staff. For anyone wanting to pay their respects, a wake and funeral will be held Thursday, October 24th from 4pm - 7pm at Staabs Funeral Home 1109 S. 5th, Springfield, IL. For this reason, the Village Administrative Office will be closed on Thursday. Thank you in advance for your understanding and sympathy. Grandview Police Department joins Click It or Ticket Campaign to Help Save Lives. Springfield, IL – The 2013 Click It or Ticket campaign kicks off May 10 in Illinois. The purpose of the campaign is to help save lives by cracking down on those who do not buckle up through the Memorial Day holiday weekend. The Grandview Police Department is joining the Illinois Department of Transportation (IDOT), the Illinois State Police (ISP) and over 500 local law enforcement agencies across the state to save more lives by strongly enforcing seat belt laws. Provisional numbers show that during the 2012 Memorial Day weekend there were six fatalities and almost 600 injuries on Illinois roadways. Three of those fatalities were alcohol-related. Remember – wearing your seat belt is your best defense against an impaired driver. According to the U.S. Department of Transportation’s National Highway Traffic Safety Administration (NHTSA), 52 percent of the 21,253 passenger vehicle occupants killed in 2011 were not wearing their seat belts at the time of the crash. As noted, deaths involving seat belt nonuse are more prevalent at night than during the daytime. According to NHTSA, 62 percent of the 10,135 passenger vehicle occupants killed in 2011 during the overnight hours of 6 p.m. to 5:59 a.m. were not wearing their seat belts at the time of the crash. In 2011, seat belts saved an estimated 11,949 lives nationwide according to NHTSA. While this year’s Click It or Ticket enforcement campaign runs from May 10 through May 27, officers are out enforcing seat belt laws year-round. Buckle up and encourage your loved ones to do the same. You will save the cost of a ticket and may save a life. For more information about the Click It or Ticket campaign, please visit www.buckleupillinois.org. From March 14th through March 17th, the Grandview Police Department will be participating in the Illinois Department of Transporation's Click It or Ticket / Drive Sober or Get Pulled Over campaign. For more information about these campaigns, please visit www.buckleupillinois.org. Grandview officers will join officers from all around the state in providing extra patrol for the enforcement of seat belt usage and impaired driving. This campaign is to make sure motorist road trips are safe as possible during the St. Patrick's Day holiday period. From November 12th through November 25th, the Grandview Police Department will be participating in the Illinois Department of Transporation's Click It or Ticket / Drive Sober or Get Pulled Over campaigns. For more information about these campaigns, please visit www.buckleupillinois.org. Grandview officers will join officers from all around the state in providing extra patrol for the enforcement of seat belt usage and impaired driving. This campaign is to make sure motorist road trips are safe as possible during the Thanksgiving holiday period. The hours for Village of Grandview Trick or Treating will be from 4:00pm to 8:00pm on October 31st. The Grandview Police Department will again be passing out candy on the corner of Wolfe and Converse beginning at 6:00pm while supplies last. The police department is reminding children and parents to use caution while crossing any streets, only go to houses with lights on, and always stay out front. Motorists are also urged to use caution and watch for the several small children that will be in the neighborhood. Grandview will be hosting a Fall Festival on Saturday, October 20th at the Grandview Municipal Building (1620 N. Milton). The time will be 5:00pm. There will be free food (Chili, hot dogs, drinks and more). There will also be games for the kids, door prizes, silent auction items, and candy. Door prizes will be given away at 6:00pm and silent auction items will be given away immediately after door prizes. Proceeds will be used to help re-pave the basketball court located at the Grandview Park. Come out for a few hours and get to know your neighbors and play some games. Hope to see everyone there. The Village of Grandview has rescinded the Burning Ban. You are now allowed to burn yard waste only during permitted hours. The Board checks the US drought monitor's website to determine the dryness of our area. You can access the website by clicking here. Yesterday the Grandview Police Department took a couple reports regarding people missing items from thier vehicles. Unfortunetley we occassionally have people walk the neighborhood in the early morning hours targeting unlocked cars. These people are usually looking for loose change but will take anything that has any amount of value and is not secured. It has been a long time since we have had any thefts from vehicles involving forced entry and would encourage people to make sure thier vehicles are locked overnight. Anyone witnessing suspicious people should call the police. These types of calls should be placed directly to Sangamon County Dispatch at 753-6666. THE VILLAGE OF GRANDVIEW HAS ISSUED WATER RESTRICTIONS THAT MIRROR THE CITY OF SPRINGFIELDS WATER RESTRICTION ORDINANCE. TO VIEW THIS ORDINANCE IN DETAIL PLEASE CLICK THE LINK BELOW. Effective July 18th, 2012 the Village of Grandview issued a burning ban effective immediately. Burning of any means is strictly prohibited until it is determined that the village is no longer in extreme drought conditions. On behalf of the Grandview Village Board and the Grandview Police Department, I would like to announce the launching of our new Village of Grandview WebSite. The WebSite improves the village's ability to keep the public informed. The web page has been in the works for over a year but is now ready. There will be periodic updates and changes to the WebSite as we continue to build on it. Special thanks should be sent to our officer adminstrator, Lisa Cave. Lisa put a lot of time and effort gathering much of the materials you will find on this WebSite. "Water Department" - Provides citizens information about the water department operation, including a link for direct enrollment for services. "Village Business" - provides information such as officer hours, scheduled board meetings, monthly news letters, and much more. "Police" - contains information concerning some of the more important ordinances and community services, such as "Vacation Watches." In the very near future, a link will be provided where citizens can provide the police department with annonymous tips regarding crime within the Village. "Neighborhood Watch" - News regarding the newly formed "Neighborhood Watch Program" can be found in this location. "News and Alerts" - This section will contain a variety of subjects that are important to village residents. News and alerts will be issued for such things as street closing's. crime issues, community functions, and much more. Some news and alerts will also be located on the Village of Grandview Police Department FaceBook page. Again, I would like to welcome you to our WebSite and ask that you tell your friends and family to check us out. The Grandview Police Department will use this website to post information that we believe is important for the community to know. In the future we will provide a link to allow citizens to provide crime tips to the police. In the meantime we would still encourage citizens to call the Grandview Police and report suspicious or illegal activity. WE DO NOT WANT ANYONE CONFRONTING SUBJECTS!!! As most people are aware of, the entire area has seen a rise in copper thefts. In recent months, Vaughn's Appliance, 2303 N. Grand E, has been the victim of these thefts on more than one occasion. Two weeks ago, in addition to trying to remove copper from the air conditioning unit of the business, a large storefront window was shot out with a B.B. gun. We ask that anyone observing any suspicious behavior in this area please call the police. We also ask that anyone having any information on this theft and criminal damage call the police or CrimeStoppers. I'm sure everyone has noticed that the weather is much warmer than normal for this time of year. What this means is that we have been witnessing an increase in the amount of people walking around the village at night. Village residents are encouraged to be aware of individuals out at all times of the day and be alert for suspicious behavior. I am pleased to annouce that our "tip line" is now functional. Anyone can go to this website and click on the "tip" link. Information concerning any criminal activity can be sent to the Grandview Police Department. Anyone wishing to remain completely annoymous may do so. Persons leaving a tip may also leave their name or e-mail address if they wish to be contacted by an officer. I am sure that many people are still unaware Grandview has developed a web page and that these resources are available. I would ask those of you who do check this to please pass on this information so that many more people will utilize this website.